The transformation case study of the US Army Air Corps in the interwar years focused largely on the personality of BG William “Billy” Mitchell. He has since then been considered one of the “fathers” of the modern US Air Force. Was he really a positive force for the transformation of the Air Force? Could his efforts have been more effective if he had worked inside the structure of the military as did his superior, Major General Mason Patrick, the Chief of the Air Service? Air power doctrine as advocated by Italian theorist Giulio Douhet, Hugh Trenchard, and Billy Mitchell predicted essentially that decisive strategic effects could be achieved from air. In other words, air power was capable of winning wars without the assistance of the other services. This theory has been echoed by modern US Air Force leaders such as Air Force Chiefs of Staffs Michael J. Dugan and Merrill A. McPeak. These ideas have been detailed in such popular discussions of air strategy as The Air Campaign and Shock and Awe. Can air power win wars decisively and at low cost in some cases? If it can not, what capability justifies a separate Air Force? If it can, does that argue against jointness as central component of US military doctrine? One of the most dramatic transformation that occurred in the interwar years was the transformation of ground combat. The attrition focused stalemate of the trenches evolved into a new dramatic form of maneuver warfare developed primarily in Germany. When it was executed during the opening months of WWII it was popularly called blitzkrieg and military professionals and the general public alike associated the technology of the main battle tank with this new form of warfare. Was the main battle tank the key enabling technological component of blitzkrieg or was it something else? Was technology really the most important aspect of blitzkrieg? How would you describe the importance of doctrine and leadership, including the idea of mission command, to the blitzkrieg concept. Finally, was blitzkrieg really a new way of war, or simply a better way to prosecute an old way of war? A variety of factors influence transformation. Usually, however, one factor is the initiator. For example and obvious dangerous threat which has defeated a country in the past could be the factor which initiates the transformation process. Once that initiator is successful in “kick-starting” the transformation process the remaining factors interact with each other dynamically to eventually achieve the end result product of transformation. Which of the factors was the most important for starting the transformation process during the interwar years? 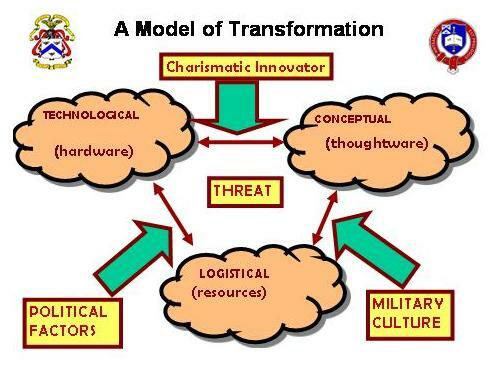 In some countries and military services transformation did not occur, or failed to transform into a successful form. In the interwar years what factor was the most important to inabling or preventing successful transformation? The dynamics that effected transformation in the interwar years continue to effect transformation today. Which is the most important factor effecting transformation in the U.S. military today?